1 Preheat oven to 190°C, 170°C fan, Gas mark 5. Cook the pasta as instructed on the pack. 2 To make the sauce, melt the Flora and add the flour stirring to make a roux. Mix the milk and water together and add slowly to make a smooth sauce. 3 Add the Knorr Vegetable Stock Pot to the sauce so it melts and simmer the sauce for 2 minutes – stirring gently so it doesn’t catch. 4 Add the tuna, sweetcorn and pasta and mix together. 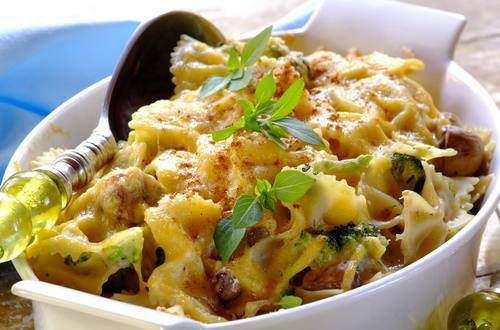 5 Place in an ovenproof dish, top with the grated cheese and dollop the pesto over the top. 6 Bake in the oven for 25-30 minutes.